Usain Bolt, a sprinter from Jamaica, won the bronze medal in the men’s 100m dash. That could be the opening line of reports written by journalists covering the event. But it’s not – not anywhere, and not here. Mason Finley, a thrower from the United States, won the bronze medal in the discus. Yes, that’s a likely lead. How different bronze looks when it’s worn by Usain Bolt and Mason Finley. 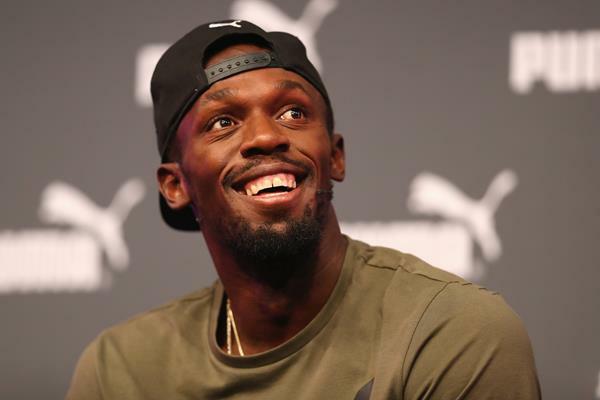 Bolt is, of course, not just any sprinter, but one who changed the face of the sport. To say that the sport is in his debt is to put it ever so mildly. While bronze may seem a disappointment now, some perspective is in order. Bolt won silver in the 2007 Osaka 200m. He wasn’t perfect in the 100m, either, as we seem to forget; he false-started in the 2011 World final in Daegu. With time, I hope we’ll view this bronze differently than we might today. Our long-term perspective should be that, in sprints, he medaled in senior major championships over the course of 11 years, which is an utterly remarkable and unlikely achievement. Bolt first appeared on the world scene in the World Youth championships – in 2001. A space odyssey, indeed. This was a down year for the 100m and a down year for Bolt. Bolt’s start was not that of a world champion in any of his races here, and while it was not a huge surprise that he lost – well, there’s that word again. He finished 3rd. In the entire world. But his previous achievements led us to expect more than we had a right to. For Mason Finley, the excitement of the final four rounds was palpable. 16th on the discus world list coming into this meet, Finley stated after qualifying that his goal was to break the 66m barrier again. Finley, who was 11th in the Rio Olympics at 62.05/203-7, brought a PB of 66.72/218-11, set in 2016, to this meet. So he threw over 67m on his first throw. And over 68m on his second. From the second round on, he was in bronze medal position, and he defended it vigorously throughout. The countdown was on. Throw after throw, round after round, champion after champion came after Finley’s 68.03/223-2 - a stunning number for him regardless of place. Finley’s bronze is an unexpected triumph. While it’s tempting to say that he is the little engine that could, I did note during our interview that I was looking up at the underside of his chin. He’s 6’8”, 345lbs. 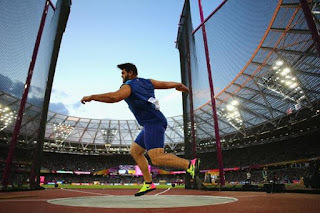 Finley was thunderstruck at his achievement, and when asked how bronze changes his view of where he fits in the discus cosmos, he demurred and asked for time to absorb it all. The other bronzes won Saturday night were by Ruswahl Samaai of South Africa in the men’s long jump and Agnes Jebet Tirop of Kenya in the women’s 10,000. While Samaai, 25, has been nipping at the edges of major meets, he had yet to medal. He has been operating in the shadow of his teammate, Luvo Manyonga, this year’s champion. Samaai finished well. He claimed bronze on his 5th jump and then his 6th was best of all. Agnes Jebet Tirop, 2015 World Cross Country champion, twice finished 3rd in the World Junior 5,000m, and on Saturday won her first major meet track medal, bronze in the women’s 10,000m. Think there’s not joyous celebration in her camp today? Most certainly, though at 21, her potential is vast and the color of her medals is sure to change. Of the four finals Saturday night, how do the bronzes rate? Three joys and a disappointment, though not nearly the disappointment it seems on the face of it. Gold doesn’t tarnish. With proper care, neither does bronze. Just buff it from time to time to reveal the master craftsman’s achievement underneath. photos courtesy of and copyright by Getty Images/IAAF. Bolt is, of course, not just any sprinter, but one who changed the face of the sport. To say buffet near me chinese that the sport is in his debt is to put it ever so mildly. While bronze may seem a disappointment now, some perspective is in order. Athletes have their own place in this world, and that is very special. People like Usain Bolt, and Mason Finley are our inspiration for athletics. The boomessays.com review is conducted to show the best athletes in this world to people. Thanks a lot for sharing such a legend here. Usain Bolt has been the most amazing person which such an amazing stamina like none of other. He is surely able to win any race in which he has been paid essay writing service getting in to play till the ending stage.